Samsung's Gear S3 is an excellent smartwatch, but can it topple the Apple Watch? After what seems like an age - the Samsung Gear S3 is finally here. You can buy it from shops and everything, but the question is, should you? We’ve spent a (rushed) week with a Classic model to find out. 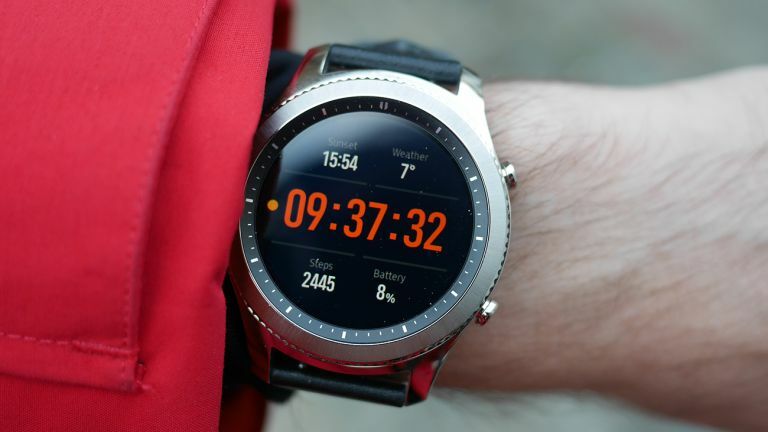 We absolutely loved the Samsung Gear S2, it was the first worth competitor to the Apple Watch. The Gear S3 is a more dramatic change than we were expecting (especially in terms of design), Samsung has improved in some areas, but taken a step backwards in others. aOn of the biggest departures from the Gear S2 is the design language. It still seems Samsung are testing the waters here, throwing ideas at a wall and seeing what sticks. While the Gear S2 had a ‘futuristic-chic’ aesthetic about it, the S3 now resembles a much more traditional timepiece. The question is, do you want a smartwatch to look like an analogue watch? I’m not so sure. Obviously, you can make your own mind up as to whether you like the Gear S3’s design, but personally, I’m not a fan of the ‘Classic’ model. It manages to be both bland and fussy at the same time. It seems Samsung has tried to make the smartwatch as inoffensive as possible, so it appeals to a wider audience, but as a result the wearable has become too nondescript. There’s no flare. The Frontier model is much better, and has small flourishes which make it more pleasant to look at. Perhaps sensing a niche, the Gear S3 is a very masculine watch, almost the complete antithesis to the Apple Watch. It’s chunky, at 49 x 46 x 12.9mm. Perhaps that’s too chunky for some, but I didn’t find it uncomfortable during the review. The screen is excellent. It uses a large 1.3-inch, 360 x 360 AMOLED touchscreen. It’s bright, sharp, and vibrant - a real pleasure to use. In terms of ergonomics and usability, the Samsung Gear S3 is the best smartwatch out there. The rotating bezel and two buttons are an excellent way of navigating the UI. Thankfully there are more strap options now. The proprietary fixing has been replaced by a standard 22mm bar, meaning you’ll be able to use pretty much any watch strap. You’ll probably want to do that, because the leather strap the that comes with S3 feels quite cheap. The Gear S3 is IP68 certified for water resistance, so you can submerge it in up to 1.5 metres of water for 30 minutes. The battery life is the best of any smartwatch out there (except the Pebble - R.I.P). The large body makes room for a massive battery - the Gear S3 packs a 380 mAh cell - which really does last between three and four days. We couldn’t believe how great it was. Elsewhere in the specs department, it has a dual-core 1.0 GHz processor and 768MB RAM. That doesn’t sound like much, but it’s more than enough to keep things running really smoothly. There's 4GB of storage to hold apps, images and music. It also packs Wi-Fi, GPS, an accelerometer, gyroscope, heart rate sensor, and barometer. It has all the sensors for fitness tracking, but due to the design and accuracy of the sensors you're probably better off with a dedicated fitness wearable if your really into working out. It'll do a good job of step counting and overall activity, however. In the US the Frontier model has an e-sim (so it can make calls and use data independently from a smartphone) and uses NFC for Samsung Pay. Neither of these features are available in the UK. Thankfully, one thing that remains largely unchanged is the operating system. Tizen is still our favourite wearable OS, despite Apple’s watchOS making great strides recently. It's not as fiddly as watchOS and there's a lot less swiping required than Android Wear, mainly thanks to the rotating bezel. Information cards can be viewed by rotating the bezel clockwise, and notifications can be viewed by rotating it anticlockwise. It's a really slick UI, and very intuitive to use. The biggest problem we had last year was Tizen’s lack of applications. This situation has been improved over the past year, but the ecosystem is still unable to match Apple's. There are some big names, like Spotify (coming soon), KLM, BMW, Nike+, Uber, Nest and Philip Hue. It’s come a long way, but there’s still a way to go. Especially considering that most quality apps, like Nest for example, actually cost money. The Samsung Gear S3 offers some clear improvements over the previous generation - most notably the amazing 3-4 day battery life. That really is class leading for an advanced smartwatch like this. The excellent rotating bezel and Tizen OS have been carried over. Making this one of the best smartwatches you can buy. It's difficult to unreservedly recommend, however. The Gear S3 also happens to be one of the chunkiest smartwatches out there, meaning this is a no-go for more delicate wrists. There's also a disappointing number of free apps, still. Despite that, fi you're in the market for a smartwatch - Samsung's Gear S3 is still the best device available for Android phones.